Why just be a wimpy kid when you can be an awesome friendly kid too? In the newest addition to the Wimpy World, you can be both! In DIARY OF AN AWESOME FRIENDLY KID, readers see the world through the eyes of Rowley Jefferson as he writes about his own life and attempts to author a biography for his best friend, Greg Heffley. 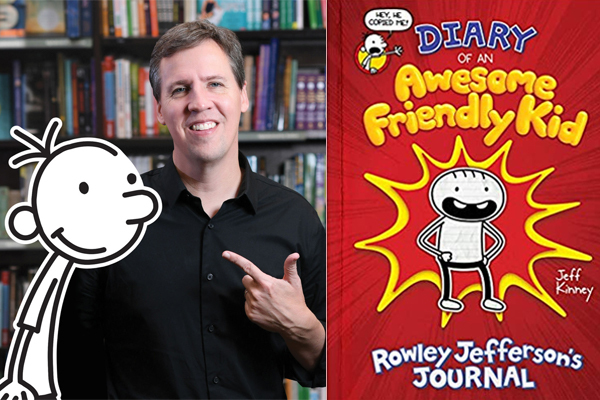 Celebrate the new book at an event with our very own Jeff Kinney and experience the Wimpy Kid universe in a whole new way! Tickets include one (1) copy of Diary of an Awesome Friendly Kid and admission for two (2). Jeff Kinney is a #1 New York Times bestselling author and a six-time Nickelodeon Kids’ Choice Award winner for Favorite Book for his Diary of a Wimpy Kid series. Jeff has been named one of Time’s 100 Most Influential People in the World. He is also the creator of Poptropica, which was named one of Time’s 50 Best Websites. He spent his childhood in the Washington, D.C., area and moved to New England in 1995. Jeff lives with his wife and two sons in Plainville, Massachusetts, where they own a bookstore, An Unlikely Story. For more Wimpy Kid visit wimpykid.com.